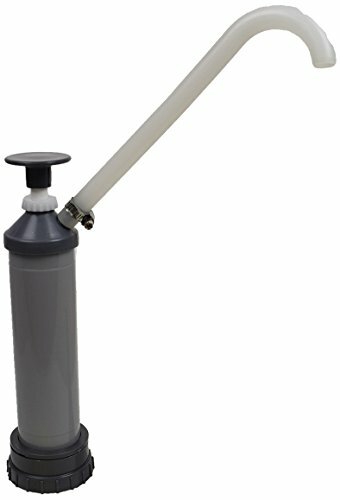 This Action Pump 4007 hand-operated siphon pump is made with polyethylene for resistance to chemicals, has a flow rate of 2 gallons per minute (gpm), and is suitable for dispensing or transferring kerosene, light oils, or various water-based solvents that are compatible with polyethylene. It has an overall length of 25", a 21" suction tube, and an 18" discharge tube. This siphon drum pump is suitable for use with 5 gallon drums in a wide variety of industrial, commercial, and home applications. 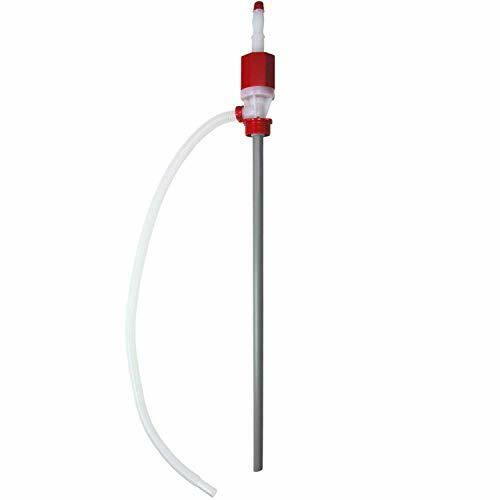 Specifications Pump Bellows action siphon pump Materials Polyethylene Flow rate 2 gpm Discharge port 0.6" Maximum temperature 140 degrees F For use with 5 gallon drums Weight 0.3 lb. Dimensions Overall length: 25"; Suction tube: 21"; Discharge tube: 18" Pumps use mechanical action to move liquids, gases, or slurries (solids suspended in a liquid or gas). The mechanical action is categorized as either positive displacement (PD) or kinetic. PD pumps capture and release discrete amounts of flow into a chamber and then force it out. Some examples of PD pumps are fuel and oil pumps in cars, pumps in hydraulic systems, and bicycle pumps. Kinetic pumps move liquids, gases, or slurries by transferring energy from the pump's movement to the flow. They use an impeller to draw the flow in, add energy to the flow, and move it through a volute (a spiral funnel through which the flow moves), and into the system. Some examples of kinetic pumps include centrifugal (the most common pump in industrial applications), in-line pumps, sump pumps, and suction pumps. Energy sources for all types of pumps include wind power, manual operation, electricity, and gasoline or diesel fuel. 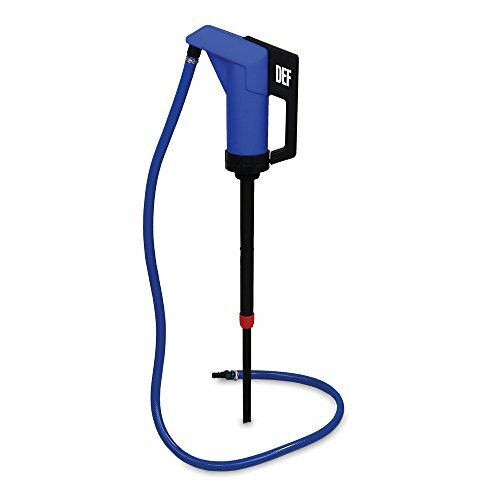 This Vestil LDP-POLY-304 hand-operated polypropylene and stainless steel lever pump has a flow rate of 12 oz. per stroke, and is suitable for dispensing liquids from 55-gal. drums. It has a polypropylene body for resistance to chemicals, and has internal components made of 304 stainless steel for resistance to corrosion. The pump fits 2" bungs and is 44" long overall. This hand-operated polypropylene and stainless steel lever pump is suitable for use in a variety of industrial and commercial applications. Little Giant's small submersible oil filled pump with corrosion resistant nylon housing is meant for commercial, industrial and home applications including statuary fountains, water displays, air conditioners, machine tool coolants, and many other applications where liquid must be transferred or recirculated. 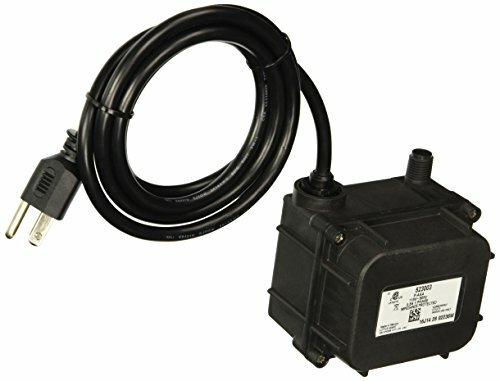 This compact 120 GPH pump features a 1/4 in. MNPT discharge, 4.6 ft. shut-off head capability, and screened inlet. Polyethylene, for use with steel and polyethylene drums. Instant "on" - "off" control provides smooth, fast flow with no dribble.Will handle viscous materials. Do not use above 125 F or in heated container. Not recommended for containers over 55 gallon or any container that fluid level is over 48" high. This Action Pump EZ-55 pump is a double action drum pump for fluid delivery on both up and down strokes. It is made of polypropylene and polyethylene for resistance to a wide range of acid, alkaline, caustic, and chlorine-based chemicals, oils, crop chemicals, diesel and liquid fertilizers. The design of the pumping mechanism eliminates the parts that wear for longer life of the unit. It has a high-volume delivery at low pressure for safety when pumping harsh chemicals. It has a 2" National Pipe Straight (NPS) adapter and a 2" buttress adapter. This hand pump is suitable for metering, plating, sanitary, chemical, and coolant applications, among others. Specifications Maximum flow rate 5 GPM Maximum head 1' / 0.43 psi Maximum operating temperature 120 degrees F Viscosity 3,000 cps / 20,000 SSU pH Low 1.00, High 12.00 Discharge port 0.63" Pump length 36.5" Action Pump manufactures drum and pail pumps and grease, oil, and lubrication products. The company, founded in 1981, is headquartered in Cary, IL. 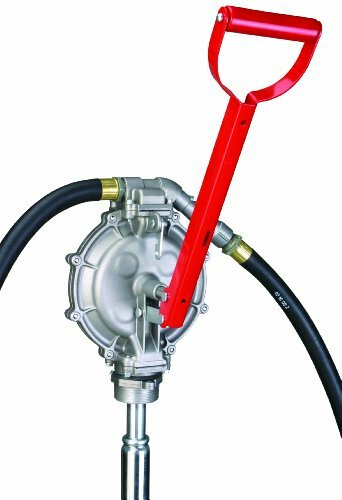 Groz 44185 plp-02 heavy duty plastic lever pump. 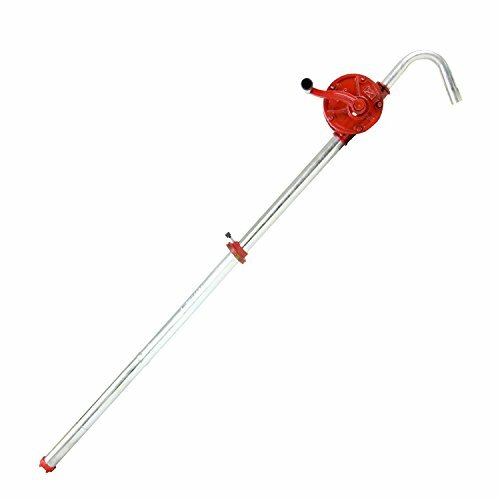 Package includes lever pump, 6.5' flexible corrugated PVC hose with " diameter, 2 piece suction tube (one rigid and one telescopic) Totaling 38 inch lever pump is equipped with an Anti-Siphon vent cap. 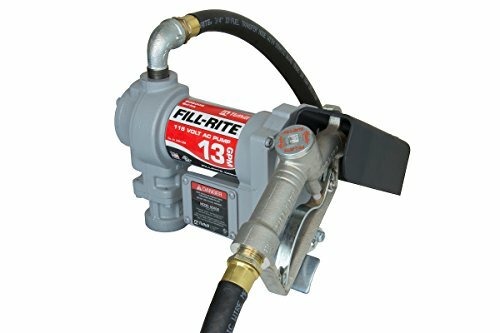 This chemical transfer pump was built from chemically inert materials for use with a wide variety of medias: agricultural chemicals, insecticides, fungicides, fertilizers & herbicides, adblue, hydraulic oils, lubricants, water based media, antifreeze, detergents, soaps, windshield washer fluid, etc. Do not use with: Inflammable liquids, thinners, solvents, gasoline and other fuels. 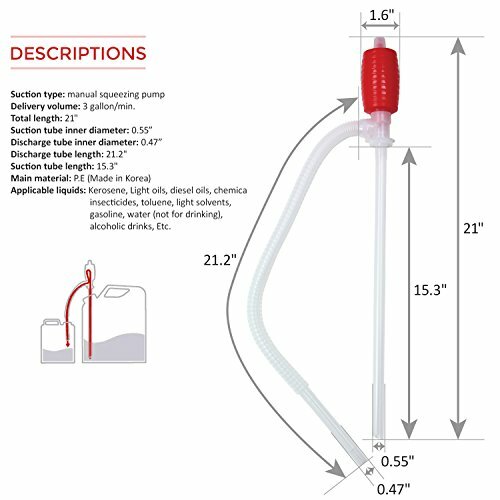 Pump Inlet: " pump output 500Ml (1 pint) per Stroke. Pump fits 15 55 gallon drums. Comes with adjustable 2 inch threaded adapter for a 55 gallon drum or fuel tank. Comes with instruction manual. 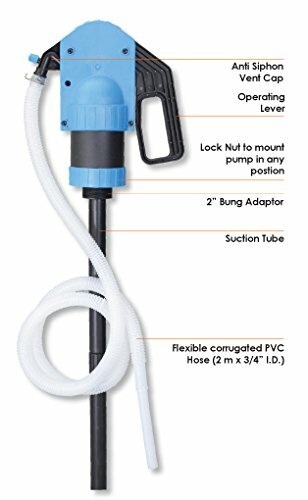 Package includes lever pump, 6.5' flexible corrugated pvc hose with " diameter, 2 piece suction tube (one rigid and one telescopic) totaling 38"
This Action Pump THP-ST hand-operated piston drum pump is made of stainless steel for resistance to corrosion, delivers 22 oz. per stroke, and is suitable for dispensing corrosive chemicals such as MEK (methyl ethyl ketone), acetone, and toluol. It comes with a 2" bung adapter. This piston drum pump is suitable for use with 15, 30, and 55 gallon drums in a variety of industrial and commercial applications. Specifications Pump Piston drum pump, hand-operated Materials Stainless steel Flow rate 22 oz. per stroke Suction port 1.5" For use with 15, 30 or 55 gallon drums Dimensions Overall length: 41" Pumps use mechanical action to move liquids, gases, or slurries (solids suspended in a liquid or gas). The mechanical action is categorized as either positive displacement (PD) or kinetic. PD pumps capture and release discrete amounts of flow into a chamber and then force it out. Some examples of PD pumps are fuel and oil pumps in cars, pumps in hydraulic systems, and bicycle pumps. Kinetic pumps move liquids, gases, or slurries by transferring energy from the pump's movement to the flow. They use an impeller to draw the flow in, add energy to the flow, and move it through a volute (a spiral funnel through which the flow moves), and into the system. Some examples of kinetic pumps include centrifugal (the most common pump in industrial applications), in-line pumps, sump pumps, and suction pumps. Energy sources for all types of pumps include wind power, manual operation, electricity, and gasoline or diesel fuel. 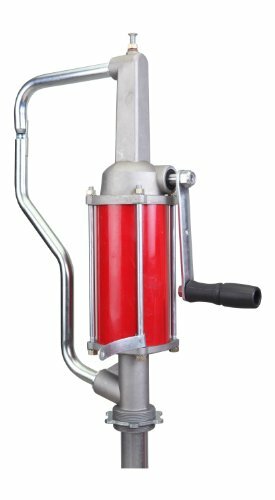 This Action Pump QS-1 hand-operated rotary drum pump is made of steel with aluminum and nitrile components, delivers 1 qt. of liquid per revolution, and is suitable for dispensing petroleum based liquids such as oils, diesel, and kerosene. It comes with a 2" bung adapter. This rotary drum pump is suitable for use with 15, 30, and 55 gallon drums in a variety of industrial and commercial applications. Specifications Pump Rotary drum pump, hand-operated Materials Steel, aluminum, nitrile Flow rate 1 qt. per revolution Discharge spout 5/8" Maximum viscosity 2,000 SSU Maximum temperature 140 degrees F For use with 15, 30 or 55 gallon drums Weight 13 lb. Dimensions Length: 25"; Suction tube: 34" Pumps use mechanical action to move liquids, gases, or slurries (solids suspended in a liquid or gas). The mechanical action is categorized as either positive displacement (PD) or kinetic. PD pumps capture and release discrete amounts of flow into a chamber and then force it out. Some examples of PD pumps are fuel and oil pumps in cars, pumps in hydraulic systems, and bicycle pumps. Kinetic pumps move liquids, gases, or slurries by transferring energy from the pump's movement to the flow. They use an impeller to draw the flow in, add energy to the flow, and move it through a volute (a spiral funnel through which the flow moves), and into the system. Some examples of kinetic pumps include centrifugal (the most common pump in industrial applications), in-line pumps, sump pumps, and suction pumps. Energy sources for all types of pumps include wind power, manual operation, electricity, and gasoline or diesel fuel. 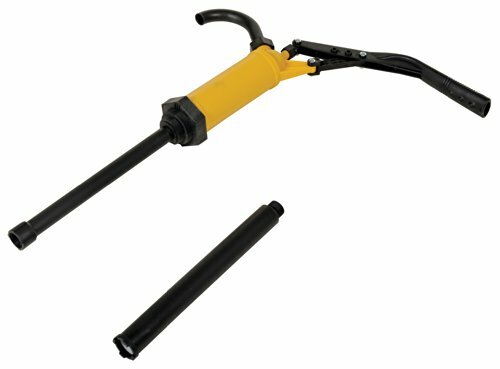 This Action Pump PP14 hand-operated drum pump is made of poly propylene for resistance to chemicals, delivers 8 oz. of fluid per stroke, and is suitable for dispensing detergents, antifreeze, mild acids, and petroleum based liquids. It comes with a 2" bung adapter. This piston drum pump is suitable for use with 15, 30, and 55 gallon drums in a variety of industrial and commercial applications. Specifications Pump Piston drum pump, hand-operated Materials Polypropylene, nickel plated steel, Viton Flow rate 8 oz. 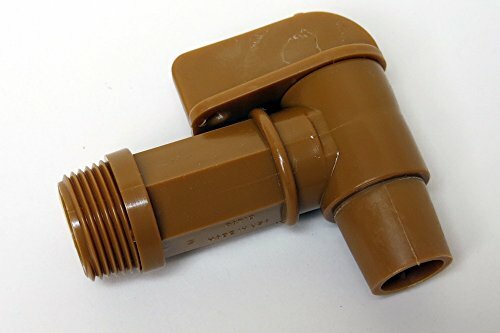 per stroke Discharge spout 3/4" Maximum viscosity 8000 SSU Maximum temperature 140 degrees F For use with 15, 30 or 55 gallon drums Weight 3 lb. Dimensions Overall length: 45"; Suction tube: 44" Pumps use mechanical action to move liquids, gases, or slurries (solids suspended in a liquid or gas). The mechanical action is categorized as either positive displacement (PD) or kinetic. PD pumps capture and release discrete amounts of flow into a chamber and then force it out. Some examples of PD pumps are fuel and oil pumps in cars, pumps in hydraulic systems, and bicycle pumps. Kinetic pumps move liquids, gases, or slurries by transferring energy from the pump's movement to the flow. They use an impeller to draw the flow in, add energy to the flow, and move it through a volute (a spiral funnel through which the flow moves), and into the system. Some examples of kinetic pumps include centrifugal (the most common pump in industrial applications), in-line pumps, sump pumps, and suction pumps. Energy sources for all types of pumps include wind power, manual operation, electricity, and gasoline or diesel fuel. Allstar 5 GPM Flow Plastic Construction Self Priming Drum Pump for 55 Gallon Drum features a drum pump/siphon which is designed to be used with a 55 gallon drum. The unit has a self-priming bulb and features a 5 GPM flow rate. It is made from quality plastic construction. It is meant to be used with low viscosity fluids. It is backed by a 90-day limited factory warranty and sold individually. Specifications Pump Piston drum pump, lever action Materials Powder coated steel, die case aluminum, die cast zinc Flow rate 10 oz. per stroke Discharge port 3/4" Maximum temperature 140 degrees F Maximum liquid viscosity SAE 60 For use with 15, 30, and 55 gallon drums Weight 6 lb. Dimensions Overall length: 50"; Suction hose: 34" Pumps use mechanical action to move liquids, gases, or slurries (solids suspended in a liquid or gas). The mechanical action is categorized as either positive displacement (PD) or kinetic. PD pumps capture and release discrete amounts of flow into a chamber and then force it out. Some examples of PD pumps are fuel and oil pumps in cars, pumps in hydraulic systems, and bicycle pumps. Kinetic pumps move liquids, gases, or slurries by transferring energy from the pump's movement to the flow. They use an impeller to draw the flow in, add energy to the flow, and move it through a volute (a spiral funnel through which the flow moves), and into the system. Some examples of kinetic pumps include centrifugal (the most common pump in industrial applications), in-line pumps, sump pumps, and suction pumps. Energy sources for all types of pumps include wind power, manual operation, electricity, and gasoline or diesel fuel. 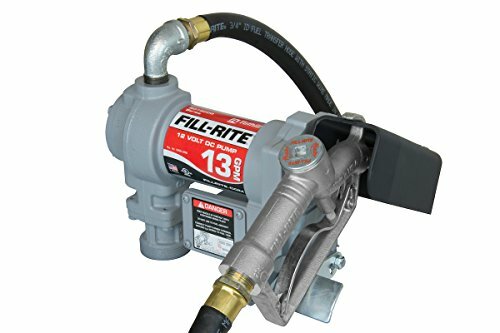 115V AC fill Rite pump, standard duty, delivers up to 13 gpm, 49 LPM, of fluid, for tank or barrel mounting, use for pumping gasoline, diesel fuel & kerosene, 3/4 inch x 10' hose, nozzle & 1 inch adjustable polymer suction pipe, 2 inch NPT, no tank Adapter needed, thermally protected, 1/4 hpul/cul listed explosion proof motor, positive displacement, rotary vane configuration ball bearing construction, no lubrication required, 30 minute duty cycle, may be padlocked, 1 year warranty. This product adds a great value. Product is highly durable and very easy to use. This product is manufactured in United States. This Action Pump DD-8 hand-operated diaphragm drum pump has an aluminum body for lighter weight and resistance to corrosion and a nitrile seal, delivers a maximum of 20 gallons per minute (gpm), and is suitable for dispensing gasoline, diesel fuel, and other petroleum products. This double-action pump dispenses liquid on the upstroke and the down stroke. It has a telescoping suction tube that can be adjusted to any length between 19-3/8 and 34-27/32". This diaphragm drum pump is suitable for use with 15, 30, or 55 gallon drums in a range of industrial and commercial applications. Specifications Pump Diaphragm drum pump, hand-operated, double action Materials Aluminum, steel, stainless steel, poly acetyl, nitrile Flow rate 20 gpm maximum Discharge spout 3/4" Maximum temperature 140 degrees F For use with 15, 30 or 55 gallon drums Dimensions Overall length: 54"; Suction tube: telescoping, 19-3/8 to 34-27/32"; Discharge hose: 7' Pumps use mechanical action to move liquids, gases, or slurries (solids suspended in a liquid or gas). The mechanical action is categorized as either positive displacement (PD) or kinetic. PD pumps capture and release discrete amounts of flow into a chamber and then force it out. Some examples of PD pumps are fuel and oil pumps in cars, pumps in hydraulic systems, and bicycle pumps. Kinetic pumps move liquids, gases, or slurries by transferring energy from the pump's movement to the flow. They use an impeller to draw the flow in, add energy to the flow, and move it through a volute (a spiral funnel through which the flow moves), and into the system. Some examples of kinetic pumps include centrifugal (the most common pump in industrial applications), in-line pumps, sump pumps, and suction pumps. Energy sources for all types of pumps include wind power, manual operation, electricity, and gasoline or diesel fuel.